Volcanic ash consists of tiny particles containing minerals and glass. LMU researchers have now used a new analytical technique based on quantitative chemical analysis under a scanning electron microscope to link their surface composition to activity during volcanic eruptions. 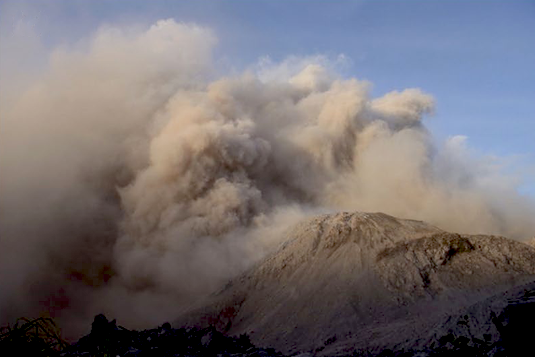 The Santiaguito volcano: The Santiaguito dome complex in Guatemala regularly spews out plumes of gas and volcanic ash. The Santiaguito volcanic complex in Guatemala first emerged on the surface in 1922, and has grown steadily since then. Over this period, one of the magma domes has discharged lava almost continuously, and often explosively releases clouds of gas and ash. Santiaguito is the source of some of the volcanic ash samples that Dr. Adrian Hornby of the Department of Earth and Environmental Sciences at LMU is analyzing as part of his EU-funded project AVAST (Advanced Volcanic ASh characTerisation). In a long-standing collaboration with researchers at the University of Liverpool, he has now applied a novel imaging procedure to examine ash samples collected on the flanks of Santiaguito. The results appear in the online journal Scientific Reports. Compositional maps of particles of volcanic ash: The ash is made up of tiny particles. 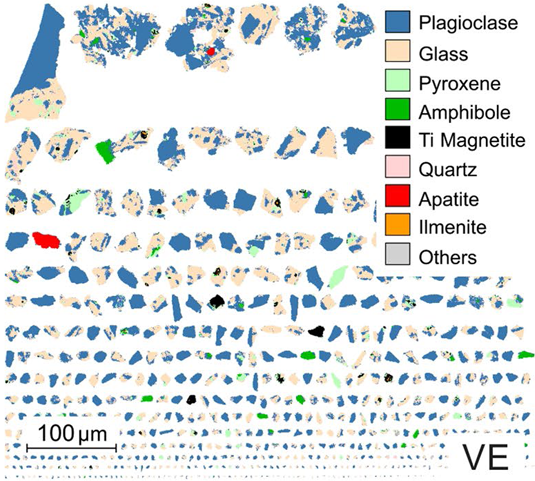 This panel shows the composition of single particles, as revealed by QEMSCAN phase analysis.